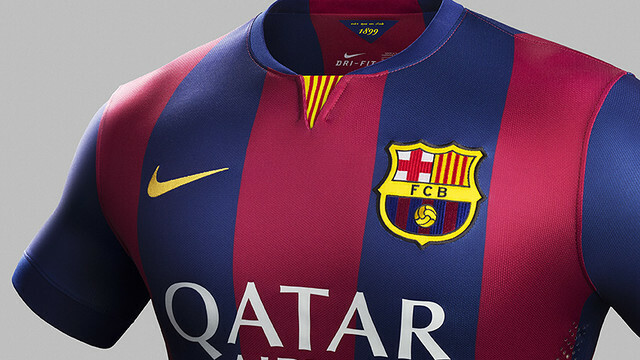 The new FC Barcelona 2014/15 home kit are designed by Nike, and they also offer the players the latest innovations in performance, technology and environmental sustainability. Nike Dri-Fit technology draws sweat away from the body to the exterior of the shirts and shorts where it quickly evaporates. This helps players to perform at their absolute best by remaining cooler, drier and more comfortable. The laser-cut ventilation holes and mesh panels featured in key areas of the kit also improves performance by increasing air circulation to the players’ bodies and regulating their temperatures throughout ninety minutes on the pitch. The kits are made of a new dual-knit fabric consisting of both cotton and recycled polyester, which as well as removing sweat offers a softer feel and an overall more flattering appearance. Nike continues to place environmental sustainability at the heart of their kits, which are again made from recycled polyester this year. These kits have been created to provide both unrivalled performance benefits and lower environmental impact. The kits are made from recycled plastic water bottles. The shorts are 100 percent recycled polyester; the shirts are 96 percent recycled polyester, while the socks are 78 percent. Each kit is made using an average of 18 recycled plastic bottles, and over the last four years Nike has diverted almost two billion of these bottles from landfills to produce their kits. By using recycled polyester Nike is also reducing the energy consumed in the entire process by up to 30 percent. The new fit allows the body to move more naturally within the kit, and so effortlessly improves players’ comfort and performance. The Nike Elite Match fit sock for 2014 also boasts a sleeker and updated design created especially for football. Nike’s designers spoke to many of today’s elite players to gain an insight in to what they wanted from a sock during a game. There are now strategically cushioned zones to provide comfort and protection around areas such as the toes and the anklebones where the majority of impact occurs, while arch support provides a firm foundation for the foot to prevent any slipping. There is less material on the sock to enhance players’ touch, while flex grooves on the ankle and top of the foot prevent bunching.